There is power in sound that has a crucial impact on our intelligence. We continually look for ways to increase our intelligence and many years ago I came across the Tomatis Method. The principles behind the healing healing method can help us see the power of sound. 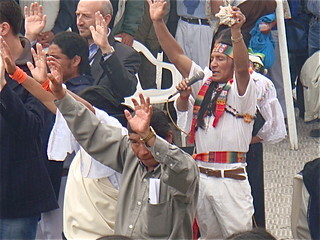 Ecuador shaman using sound from a conch shell to stimulate intelligence in a crowd. In 1953, Dr. Alfred Tomatis said The voice contains only the sounds which the ear hears. This quote basically sums up the process he created to reteach the ear to listen. There is a story that says Dr. Tomatis visited a Benedictine monastery in France in the early 1960s following the second Vatican Council. One of the decisions the council had made was to eliminate the traditional chanting for a more constructive use of time. Gradually changes took place among the monks. They became more lethargic and less motivated. In a study by the Tomatis Center in Toronto, Canada, over four hundred children and teens with histories of learning problems and under-achievement were treated. The parents graded the results of the therapy on a five-point scale. In a follow up report taken six months after the program was completed, 83% had maintained improvements, and some of these had continued to progress further. 14% of the children had maintained a portion of the gains. Only 3% had not maintained any improvements. Our senses are five of the six pathways to our ability to absorb, retain and recall information. The power of sound helps unlock all these senses so our intellect is more. We use sound, sight and smell to help expand your Super Thinking ability in our courses on writing and self publishing.